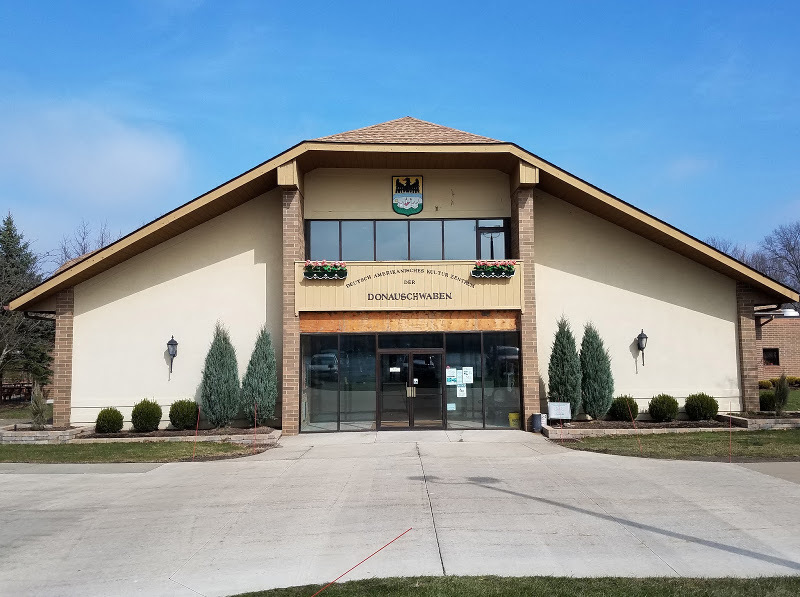 Lenau Park on Columbia Road is home to the Cleveland Donauschwaben German-American Cultural Center, but you don’t need to be German to enjoy this venue! Main Hall: The main hall can seat up to 550 guests comfortably and features a hardwood dance floor, full-size stage, private bar area and outdoor patio with view of the lake. Party Room: Located on the lower level of the hall, the party room seats up to 75 guests comfortably with an open area that can serve as a small dance floor. Foyer: The foyer features a beautiful fireplace and large windows and is ideal for a cocktail party, ceremony or reception. Auxiliary Room: The auxiliary room is a secluded location in the building next to the main hall. It can seat up to 50 guests comfortably and features its its own private kitchen and outdoor space. Pavilion and Gazebo: Located next to the lake, the pavilion features picnic tables that seat up to 400 guests. It has a bar/serving area with a large cooler, grills, portable restrooms and an open space for a dance floor. The gazebo, located between the pavilion and lake, is perfect for a ceremony or pictures. The venue features an extensive banquet menu with hors d’oeuvres and full meals. Beer, wine and liquor packages are also available. The Danube Swabians, German settlers who colonized the area near the Danube River, purchased Lenau Park in the 1970s when they out grew their former home. In 1986, they built the multi-level Cleveland Donauschwaben German-American Cultural Center. They then added the foyer in 1996. The name Lenau Park comes from from Nikolaus Lenau, a famous German poet who came to Ohio in 1832 for a short time. For more information on Lenau Park, 7370 Columbia Road, Olmsted Township, Ohio 44138, call (440) 235-2646 or email donaucleveland@gmail.com.